A fruitful investment property that offers positive returns or an easy-living option for the young couple, single homeowner or retiree. It is perfectly positioned in a serene neighbourhood, only a small walk from the iconic main street of Hahndorf that is filled with cafes, boutique shops and tempting eateries. This neat and tidy abode is ready to move straight into and live a life of ease. You won't have to spend your weekends on maintenance; you'll have time to enjoy hobbies and the beautiful Adelaide Hills. 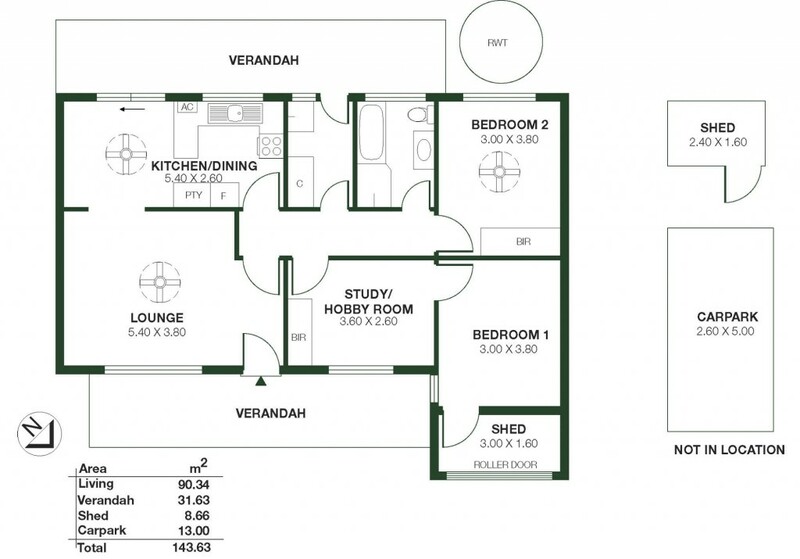 With a practical floor plan, this home has all the facets of a contented lifestyle; whether you are a busy professional or are looking for stress free and secure living. There are two bedrooms of generous size, along with a third room that could be utilized as a home office, dressing room, nursery or enjoy your life of leisure with a dedicated hobby room. The lounge sits peacefully at the front of the property with a large light filled window and ceiling fan and flows through to the hub of the home. Casual dining connects to the recently updated kitchen with ample built in cupboards and storage space. A sliding door opens straight out into the private backyard that has an established garden which takes minimal effort to uphold. The backyard is complete with veranda, alfresco and garden shed. Additionally, your very own rainwater tank provides fresh water and helps cut down on utility bills. A garage, converted to a store, or small shed is the perfect space to occupy extra belongings that need a hide-away home and the neat paved region at the front of the home warmly welcomes you inside. And the life of ease continues with options of accessing city life via the freeway in less than half an hour, shopping locally in Mt Barker within minutes, or stroll around the gorgeous leafy village of Hahndorf. This unmissable opportunity offers light and neutral dÃ©cor throughout and is just waiting for you to make it your new home.